Sheffield Print Fair: Sheffield Print Fair 2015 - Call For Artists! Sheffield Print Fair 2015 - Call For Artists! A year flies by, doesn't it?! 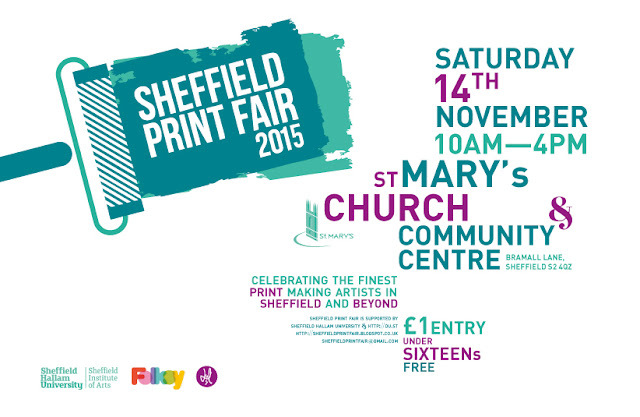 We are proud to launch 'Sheffield Print Fair 2015', which will take place on Saturday 14th November 2015, at St Mary's Church & Community Centre, Bramall Lane, Sheffield. The event will run from 10am until 4pm, and will feature printmaker stalls as well as print demonstrations throughout the day. In previous years we were bowled over with the interest from applicants and people on the day, so we are very much looking forward to this one! We are now being supported by Folksy, as well as our other champions Dust and Sheffield Hallam University, and have expanded this event to 44 stalls, from the 35 in previous years. The application deadline is 13th September 2015, and we will inform all applicants of the result by 30th September 2015.